We were intrigued when we saw a report of what a number of top chefs fix to eat for themselves when they are home alone. 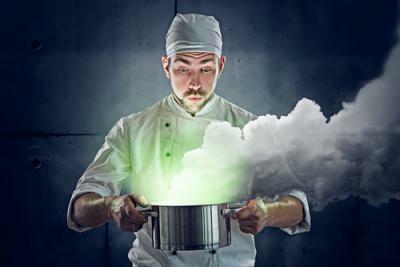 Do they experiment with even crazier things than in their famed restaurant kitchens? Au contraire - chefs report that when home alone they tend to make spicy cheese on toast, or cheese with crusty bread and a glass of dry white wine, egg drop soup, canned tuna on toast or just have a big bowl of chocolate ice cream. It's pretty simple fare when considering the complexity of what these famous chefs do all day. Similarly, bank CFOs probably do not go home and stress test the family's income and expenses with a number of economic scenarios and interest rate cycles. Nor do they apply a life of loan analysis on their home mortgage. Maybe everyone should do this, but overall, it's just simpler with individual finances. Individual finances in a certain way are not so different from bank balance sheets as they have a large imbalance between long and short durations, except that the liabilities are very long (the mortgage) and the assets for most working age people don't generate enough income to pay the debt service on the liability. Oh well, this is why we get up and go to work every day. Regulators don't look at personal balance sheets, but they are very concerned about the lengthening duration on the asset side of bank balance sheets vs. what could be quite short duration on the liability side. In an era of rising interest rate risk, this is a risky structure indeed. Certainly the yield curve has thrown everyone a curve ball lately with the decline of longer term rates. This is despite the near certainty that the Fed will raise rates sometime this year. It makes sense that when rates are low, many customers are asking for longer maturity dates on their loans, but not everyone. Some customers have become complacent with dropping rates and are not sure it's important to lock in, since they have not been penalized for not doing so over this long period of low rates. These borrowers may be in the same circumstance when refinancing time comes as many borrowers with prime-based and other floating rate loans. If they are unable to absorb an increase in debt service, credit risk is a concern. Longer duration assets along with the wild card of the unknown duration of liabilities make interest rate risk a primary concern among examiners. As such, they are monitoring increasing concentrations in long-term assets and questioning banks more and more. This focus includes loans (as many borrowers have moved to long term fixed-rate instruments), mortgage-backed securities (which are extending in duration) and callable securities (which are less likely to be called). The FDIC makes the following recommendations regarding the measurement of interest rate risk: establish appropriate risk limits, perform 300bp to 400bp interest rate shock scenarios, enhance/support key assumptions used to analyze IRR, especially deposit and prepayment assumptions, refine sensitivity testing of key assumptions and strengthen the independent review process. By preemptively measuring and managing these possible scenarios, banks are better prepared for whatever economic scenario may come down the road. As you consider all the scenarios for increasing interest rate risk and how to mitigate it in ways that won't increase credit risk as well, we can only imagine you might have difficulty coming up with original meal plans to feed the brood at home. We therefore suggest that you offer cheese on toast with a bowl of chocolate ice cream, and explain that you are only following the lead of the most famed chefs in the business. Treasury yields fell 2bps as private payrolls came in below market expectations. Yields are up just under 2bps ahead of jobless claims, scheduled for release later this morning. The IRS reports that since 2010, about 3mm taxpayers have had personal information stolen and used to file fraudulent tax returns. A survey by the Business Roundtable of CEOs finds 80% of large business CEOs expect their sales to increase over the next 6 months vs. 74% as of last quarter. Higher consumer wages, lower energy prices and higher savings are all likely contributing factors. Javelin Strategy & Research reports about 12.7mm Americans were hit by ID fraud in 2014, a 3% decline from the prior year. The decline was driven by the large-scale replacement of credit cards following the Target breach, better awareness and better security. Of note for banks, 10% of victims of a data breach say they discontinue banking online and 8% switch their primary bank or credit union. An online survey by American Banker finds about 58% of bank executives say they are increasing their technology budgets in 2015, while 33% said they expect it to be about the same level as 2014. The most common categories were mobile payments (43%), online or mobile account opening (39%), risk management (35%), fraud management (31%) and document management (28%). The Wall Street Journal reports research by the Commerce Department finds lower gas prices are leading to an increase in consumer savings. The report finds the national saving rate reached 5.5% in Nov 2014, a full percentage point increase vs. Jan 2014 (which is also about 2x above pre recession levels). Northern Trust ($111B, IL) has agreed to pay $36mm to settle a class action lawsuit related to 1,500 retirement plans that accused it of causing large losses in its securities lending program during the financial crisis. Visa said it will support payments through Samsung Pay, as the new service makes it debut in the US this summer. Samsung Pay will be using the Visa Token Service for its client security.